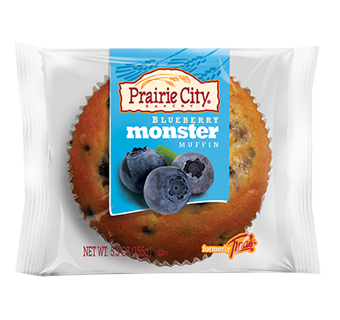 An everyday favorite… Prairie City Bakery's Blueberry Monster Muffins offer 6 oz. of blueberry bliss. Prairie City Bakery's Monster Muffins offer monster size quality in a grab-n-go package. With three flavors to suit virtually every taste, Monster Muffins are packed with huge everyday goodness made with real nuts, real chocolate and real eggs. Flavors include Banana Nut, Blueberry and Chocolate Chip.